What would be the most important message you would give to your child who is facing marriage, one of the biggest decisions in their lives? Numerous parents may be baffled by the question, probably because there are just so many things to explain but so little time. Not to worry. Ven. 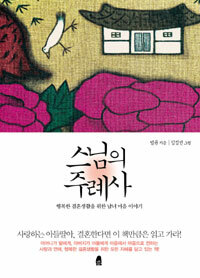 Beopryun's new book "A Monk's Message to Newlyweds" is a compilation of his essays and advice he wrote on an Internet website concerning the issues of love, relationships and marriage. "You must get married when you don't feel lonely when you are alone and don't feel suffocated by living with someone else. That's the perfect time when marriage cannot affect and place both of you under restraint," the monk writes. The book is simple and straight to the point. Most importantly, it really makes the reader think about relationships, not in a complicated way but in a more subtle and dignified manner. Through his wise words and advice, readers will be able to realize what really is important in a relationship; not money or fame, but knowing and accepting your true self.